For stocking stuffers, we look for special items around $10 (or less). Here’s the first bunch of gourmet foods we’d like to find in our stocking. 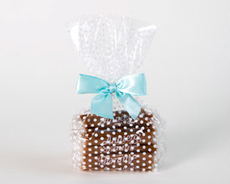 In polka dot gift bags of 20 caramels, Annie B’s caramels are sure to please. The Signature Mix includes Butter Rum, Chocolate, Sea Salt and Original (vanilla) caramels. The Holiday Mix has Chocolate Raspberry, Peppermint and Pumpkin Spice caramels. The Chocolate Lovers Mix has Chocolate, Chocolate Sea Salt and Chocolate Raspberry. Each bag is $8. There are larger gift boxes and keepsake metal tins, $24. Get them at AnnieBsCandy.com. These sweet Italian Christmas breads now come in 3.5-ounce mini sizes—the equivalent of a breakfast pastry or a croissant. But what a pleasure biting into the little domed yeasty raisin bread (panettone) or sponge cake (pandoro)—we prefer the panettone. They’re $2.99 each at PiccolosGastronomia.com. If you want to give a full-size version, no one will be disappointed. It just won’t fit in the stocking. See the whole line at BauliUSA.com. The line is certified kosher by Star-D.
Chocolate bars from two prestige producers are just right for stocking stuffers. Cailler (kai-YAY) from Switzerland is very smooth and creamy milk chocolate. The Swiss invented milk chocolate, so you know it’s special. Choices include plain Rich and Creamy, plus Hazelnut, Almond Hazelnut and Cranberry and Almond Hazelnut and Raisin. Each bar is packaged in charming box-like wrapper. There are also dark chocolate bars and boxes of bonbons. Three individual bars are $13.50 at Amazon. For more information visit Cailler.com.us. 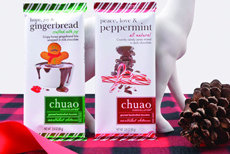 Chuao Chocolatier (chew-WOW) in California makes two holiday chocolate bars we love: Hope, Joy & Gingerbread in milk chocolate, and Peace, Love & Peppermint in dark chocolate. The 2.8-ounce bars are $6 at ChuaoChocolatier.com. We’ve got to stock up on enough Gingerbread to get us through until next year’s Christmas chocolate is produced. There’s lots of hand-crafted fudge around, but The Mill Fudge Factory gets it right: just sweet enough, not cloying. It’s melt-in-your-mouth moist, hand-cut and hand-dated for freshness. The company makes classic and inventive flavors. Choose from Belgian Chocolate, Chocolate Coconut, Chocolate Salted Caramel, Chocolate Raspberry, Chocolate Walnut, Natural Peanut Butter, Penuche and Pure New Hampshire Maple. Seasonal flavors include Cranberry Maple Nut, Eggnog, Holiday Mint and Pumpkin Pie. Want a hint of spirits? Scottish Whiskey fudge is made with with Johnny Walker Red. 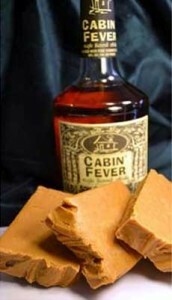 Cabin Fever Maple Whiskey Fudge is made with the whiskey declared the best flavored whiskey on the market. And Bailey’s Irish Cream Fudge is a perennial favorte. We loved every bite we tried of the regular fudge flavors. The sugar-free fudge was OK, but we could taste the erythriytol—we hope the company will consider re-formulating with maltitol (see the different types of non-nutritive sweeteners). TOP PHOTO: Annie B’s gift bag of caramels. 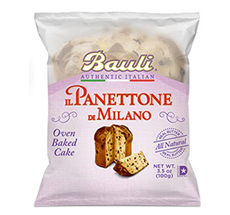 SECOND PHOTO: A mini panettone from Bauli. THIRD PHOTO: Holiday chocolate bars from Chuao Chocolatier. BOTTOM PHOTO: The Mill Fudge Factory has conventional and “spirited” fudge. All confections are available in sampler gift boxes; half-pound portions are $10, one-pound is $18.00. There are more elaborate gift baskets, a four pound Fudge Sampler for $60 and a Fudge of the Month Club 3, 6 and 12 months, $14.99 or less per month. There’s free shipping on orders of $35 or more. Go for it at TheMillFudgeFactory.com. Three of the nine flavors of Superseedz. 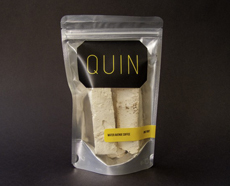 Quin’s melt-in-your-mouth marshmallows are different from any others. They’re made in foot-long lengths, then cut into thirds to fit into a stocking-worthy packet. In Coffee, Root Beer or Vanilla, they’re delicious, fun and $4 per bag (2.9 ounces) at QuinCandy.com. 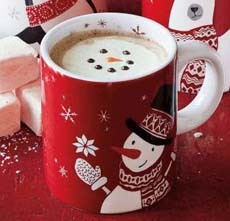 These adorable vanilla marshmallow discs with a snowman face are new and nifty. Individually wrapped in a perky square box, Frosty’s marshmallow face peers through a cut-out. Place one atop a cup of hot chocolate and it will melt into something even more delicious than it looks. The marshmallows work with coffee, too—especially flavored coffees like hazelnut and vanilla, or with a spritz of pumpkin spice syrup. We’ve used them to top chocolate teas, too. They’re $9.95 per box at SurLaTable.com. SuperSeedz was a Top Pick Of The Week in 2007, and we’ve been superfanz ever since. Pumpkin seeds are a gift for anyone: vegan and cholesterol-free with 7g of complete, plant-based protein per serving. That means they contain the nine essential amino acids (more than peanuts, pistachios, almonds and chia seeds). They’re allergen friendly: dairy-free, egg-free, fish-free, peanut-free, shellfish-free, soy-free, tree nut-free and made with gluten-free ingredients. And they’re shell-free! SuperSeedz are dry-roasted in small batches, using a proprietary pan-roasting technique that bakes the seasoning right into each seed. Superseedz are currently available in nine flavors: Cinnamon & Sugar, Coco Joe, Curious Curry, Really Naked, Maple Sugar & Sea Salt, Sea Salt, Somewhat Spicy, Super Spicy and Tomato Italiano. Find them at food retailers across the U.S., including Safeway, Sprouts and Whole Foods Markets. They can also be purchased online at Superseedz.com. Two 1-ounce individual serving pouches are $3.99; a 5-ounce pouch is $4.99. Our Top Pick Of The Week, Topperfino chocolate discs sit atop your hot chocolate or coffee, providing marvelous aroma before melting in to add Belgian chocolate to the cup. There are so many beautiful designs, in both dark and milk chocolate, that your biggest challenge will be deciding which design is perfect for which giftee. A box of 10 individually-wrapped discs is $13.99 at Topperfino.com.